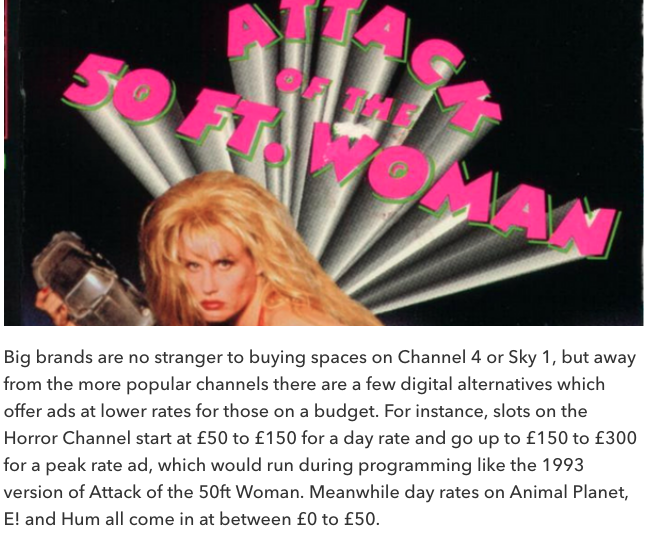 GCSE Media @ StG's: TV INDUSTRY how much do ads cost to place? TV INDUSTRY how much do ads cost to place? Have you ever wondered how much it costs companies to get their ads on TV? TheDrum on TV ad costs. Examples: a 3-second ad on primetime ITV1 can cost £30,000, but on digital channels such as the Horror Channel and Animal Planet daytime ads can cost less than £50 - you can even get an ad on some of BT Sports' less popular strands for ... £5!!! The article gives the rate for Hollyoaks on C4, a show with a similar audience to BBC3's Class.